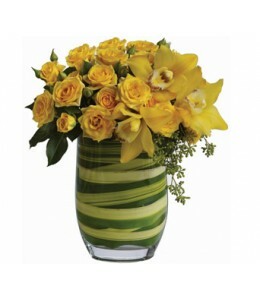 Arrangement of yellow cymbidium orchids and roses in a flax lined vase.Flowers are subject to seasonal and regional availability. In the event that any of the flowers are unavailable, the florist will.. 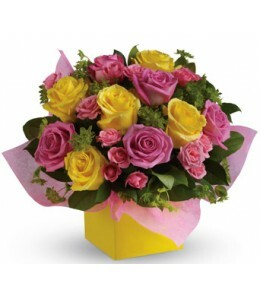 This stunning arrangement of pink and yellow roses adds an instant smile to anyone’s face.Flowers are subject to seasonal availability. In the event that any of the flowers are unavailable, the floris..
A stunning study in contrasts, this fabulously feminine arrangement mixes pale pink roses with hot pink gerberas and purple stock. 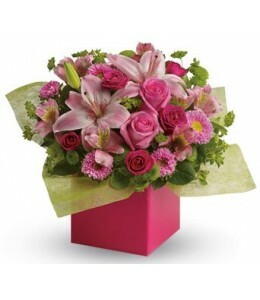 A simple way to show you care!Flowers are subject to seasonal availab..
Any time is the perfect time to send a "pink-me-up" with this lush arrangement of lilies, roses and asters!Flowers are subject to seasonal availability. In the event that any of the flowers are unavai..
Joyful moments call for happy flowers! This box of blooms does the trick with orange lilies, pink roses, yellow daisies and hot pink gerberas.Flowers are subject to seasonal availability. 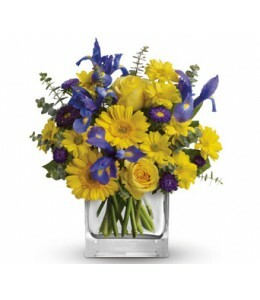 In the event..
As invigorating as a cool summer breeze, this amazing arrangement pairs eye-catching iris with golden gerberas and roses for a sunny-day sensation. This arrangement comes in a glass cube vase.Flowers .. Send smiles across the miles. 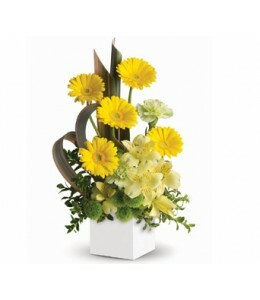 This artful box arrangement of sunny yellow blooms is specially designed to warm hearts and brighten days!Flowers are subject to seasonal and regional availability. In th.. Pure sunshine! 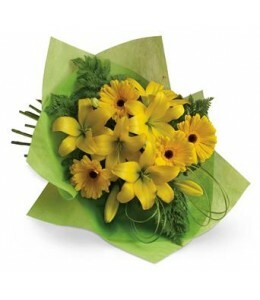 Send sunny thoughts to someone special with this bouquet of warm yellow lilies and bright gerberas.Flowers are subject to seasonal availability. In the event that any of the flowers are.. Warm, rich colours of yellow, red and purple are contrasted with fresh green. Presented in a vibrant gift box that’s adorned with colourful paper. It makes a beautiful and thoughtful gift. Brilliant? ..